Gat Jose Rizal is known to have a close relationship with her mother. Thus, everytime he requests his favorite dish to his mother, Teodora Alonzo, she would always cook it. 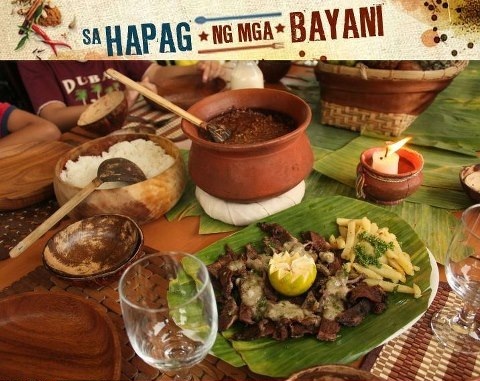 One of Rizal's favorite dish is Carneng Asada or beef steak with sauce. Her mom would travel from Calamba, Laguna to Binondo, Manila just to buy its ingredients. 1. Lard a thick cut of beef, preferably from the nape. 2. Make a marinade of olive oil seasoned with lime juice and a sprig of parsley. 3. Marinate the beef, turning it in the mixture over several hours. 4. Fifty minutes before serving, roast the beef over hot charcoal. 5. Brush the meat with marinade from time to time as it cooks. Let the meat rest before serving. 6. For the sauce or gravy, make extra marinade. Add water and enough rice flour to thicken the marinade. 7. Simmer until sauce is thick. 8. Before serving, sprinkle the meat with a bit of fine salt. Serve on a platter with fried potatoes. Serve sauce on the side.